Loudoun Castle Project has strengthened its management team following the appointment of entrepreneur and regeneration specialist Paul Dixon. Paul (pictured above0 will act as principal lead on the £525 million development, which will bring much needed investment to East Ayrshire and the wider Ayrshire economy. With over 40 years’ experience in economy boosting projects, Paul boasts an impressive CV. 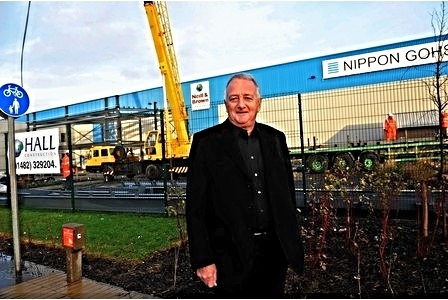 The trained accountant founded Dixon Motors in 1973 – building it up to become the third largest motor retail group in the UK. Since then the married father-of-three has held several senior positions on dozens of development projects – which have all brought lasting value to their local areas. Paul said: “I am absolutely delighted to be coming on board with the Loudoun Castle Project. For me this is a once in a lifetime opportunity to create something unique that captures the spirit of Loudoun and the culture of Scotland. I have been truly impressed by the plans for the site. “This development has incredible potential and could bring real economic, cultural and social benefit to East Ayrshire and the wider Scottish economy. “Added value is always at the heart of every project I have undertaken and I believe my experience will bring much to the development and subsequent legacy of Loudoun Castle. “In the past 40 years I have been fortunate to have been involved in a number of major regeneration projects bringing back to life everything from redundant factory sites to brownfield sites. “A number of the projects I have worked on have secured National Government or European Union Grants and this is a skill set I can bring to the table for the Loudoun Project. Should planning permission be granted for phase one, the Loudoun Castle Project will create a world class holiday and leisure destination, a brand new Loudoun distillery, up to 1,025 new homes, a renovated and stabilised Castle building and will deliver a plan for the conversion of Loudoun Castle itself into a 4/5 star hotel. Phase two at Loudoun is also being prepared for planning and will include a tourism led luxury brands outlet village of some 340,000 square feet, a whisky visitor centre selling Loudoun whisky and several new quality hotels to provide for the many visitors expected to the area. Phase one will employ 800 people from the local area in the hospitality and leisure sectors while another 1,700 new jobs will be created in the retail side of the completed development. Local universities and colleges have indicated that they will liaise with the senior management team to offer courses which can dovetail with the needs of this new and exciting development for Ayrshire. The masterplan will see the 610-acre former family theme park transformed into an all-weather resort featuring 450 luxury lodges, 12 glamping pitches, and a lake and leisure development featuring indoor sports facilities and a subtropical water park. Loudoun Castle itself will be stabilised with leading conservation specialists assessing what can be achieved for the future of the site. There will also be the creation of new communities comprising up to 1,025 new homes to enable the restoration of the Castle buildings. Timescales are subject to planning but if successful, work would begin onsite in 2017 with an anticipated opening during 2019 and phased development beyond. It is anticipated that around 1,000 jobs will be created in the construction process alone for a period of at least five years with an additional 2,500 long term jobs created through the leisure and retail offering. Plans for the residential development will feature a mix of starter homes, bungalows and three, four and five-bedroom family homes. David Mace, Chairman of The Loudoun Castle Project, said: “The Loudoun Castle development will bring significant long term benefit to East Ayrshire and indeed Scotland through jobs, investment and infrastructure. “We understand that there are several overseas investors looking to invest in Ayrshire and we believe that as a Scottish Government supported project, the Loudoun Castle Project can indeed be a cornerstone, foundation and great example of what can be done in, and for Ayrshire, with a realistic vision, a great design and project team, good solid investors and a desire to build a worthwhile legacy. “Adding the expertise of Paul to the team of leading business professionals already working on the project only reinforces that legacy. The Loudoun Castle Project has a management team with many years of experience in the property, leisure and tourism industries. Key partners include global programme management and construction consultancy Turner & Townsend, strategic planning consultants RPS and specialist castle and heritage consultant Francis Shaw of Shaw & Jagger.